Informally at home, I like to call this dish fondue chicken because that's what it reminds me of… The sauce is very similar to a Swiss Cheese Fondue in taste & texture and it goes beautifully with a pan roasted chicken breast. The lemon pepper mash complements the flavors beautifully and makes a nice stodgy base for when you're feeling properly hungry. A little kick from the cayenne pepper is just right on chilly Autumn & Winter nights… For me, this is comfort food at its finest. 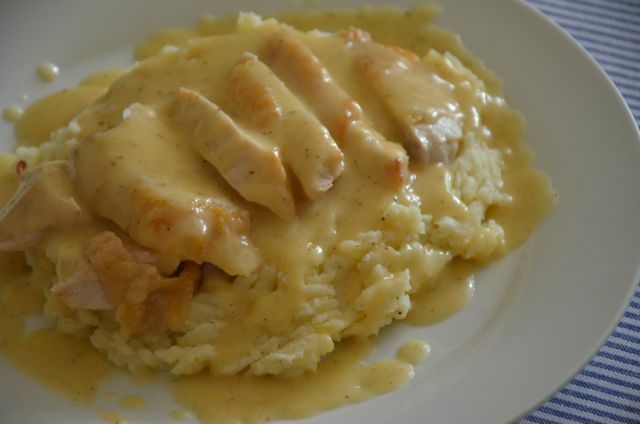 Of course you could do this chicken and sauce over a bed of rice, other vegetables or on its own if that's what you prefer and you could take this lemon pepper mash recipe and use it elsewhere. I love these two together, but that doesn't mean that you have to. Also, don't be frightened off by the recipe - it looks complicated, but I suspect after you make this once or twice, you'll find it to be a really easy dish to put together. 1. Add the chicken stock, onion, celery, carrot and vermouth to a large stock pot with a lid. Season with salt & pepper and simmer for 30 minutes before straining into another saucepan. Discard the vegetables in the strainer and put the saucepan with the stock on a burner to continue simmering - it will need to be boiling when you add it to the sauce later, but you don't want to reduce it too much. I suggest putting it on medium-low heat and increasing it if needed when you start to make the sauce. 2. Meanwhile, in another large pot, boil 500g of potatoes until soft. When cooked through, strain and set aside with the lid on to keep them warm. 3. Preheat the oven to 180°C. Heat the olive oil in a skillet that can be used both stovetop and in the oven over medium heat. When the oil is piping hot, add the chicken breasts, skin side down and cook for about 3 to 5 minutes or until skin is crispy before flipping the chicken and transferring the pan to the oven. Roast for about 15 minutes or until cooked through before removing from the oven to rest in the pan. 4. Add a knob of butter, several generous grinds of black pepper, a generous pinch of salt or two, lemon zest and a splash of milk to the potatoes and mash them in the pot with a potato masher over medium-low heat until they are smooth. Taste and adjust seasoning as needed. Remove from the heat and clamp the lid on to keep them warm. 5. In a large saucepan, melt the 25g of butter and stir in the heaping teaspoon of flour to make a roux. Once it starts to bubble, continue to stir, bubbling away for 2 or 3 minutes and remove from the heat. 6. Pour in the hot boiling stock and stir vigorously with a wire whisk to combine all of the roux with the liquid. Return the pan to the burner over medium-high heat and continue stirring with the whisk until it starts to boil. Let it bubble away for two to three minutes, continuing to stir gently the whole time. Beat in the cheese with a wire whisk until it melts and blends with the sauce. Reduce the heat to low and continue to simmer the sauce while you plate the other parts of the dish, stirring and checking occasionally. 7. To serve, divide the mashed potatoes between two warmed plates. 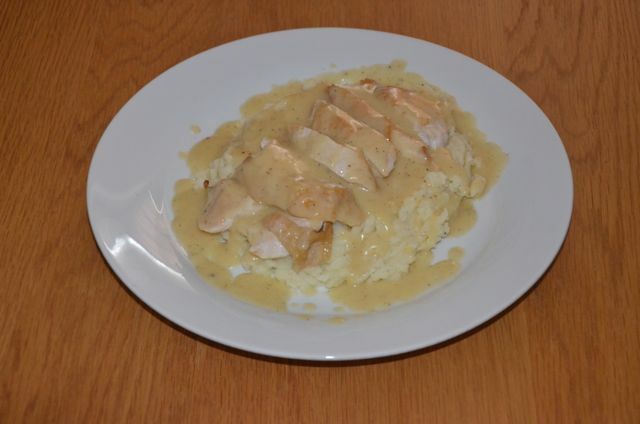 Slice the chicken breasts diagonally and lay them on top of the mash before finishing the sauce. 8. Finally, stir in a pinch of nutmeg and the cayenne pepper into the sauce. Remove the saucepan from the heat and beat in the 2nd small knob of butter. Ladle the sauce over the chicken & mashed potatoes and serve hot.